PG&E began framing the fires as caused by an unprecedented wind event with hurricane force winds. In short, the Diablo wind event was an “Act of God” that was too blame and not PG&E. It is an extremely persuasive narrative that was, unfortunately aided by inaccurate and misleading news headlines. It also provides some comfort to those affected by believing this tragedy was a once in a lifetime weather event which people have no control over. However, this narrative falls apart when the facts are examined. That is not to say that mother nature did not play a role, and a large one, in the massive destruction caused by these fires. The drought, extremely low humidity and strong winds created perfect conditions for a wildfire to grow very quickly. In fact, the fire advanced so rapidly that people died in their homes sleeping, never having any knowledge of the approaching wildfire. So while the Diablo winds certainly contributed to the destruction, they were not the cause of the most destructive fires. 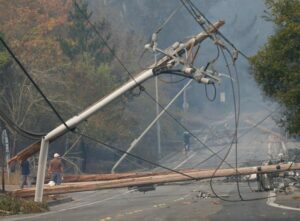 Only days after the fire outbreak began, PG&E began to use terms like “hurricane force winds,” “unprecedented winds,” “unprecedented weather event,” “hurricane strength winds in excess of 75 mph in some cases” to create the perception that Mother Nature was to blame. While the Diablo winds did gust near hurricane force it was not until hours after the most destructive wildfires (Tubbs, Nuns and Atlas Fires) had begun. Each of these fires started in a 30 to 40 minute period beginning at approximately 9:30 p.m. on October 8 when the Tubbs fire ignited near Calistoga. It was not until after 1 a.m. the morning of October 9, more than 3 hours after the most destructive fires started, that the wind gusts peaked anywhere near hurricane force levels and not until 4 a.m. did the sustained winds peak. When the Napa and Sonoma fires began, the peak wind gusts were around 30 m.p.h., hardly an “unprecedented wind event.” For example, at the weather station east of Napa on Atlas Peak, where the Atlas fire started, the peak wind gusts around the time of ignition was 32 m.p.h. and over an hour later the peak gusts had decreased to 30 m.p.h. As Jan Null, a meteorologist for Golden Gate Weather Services noted, “It was a strong wind event, but not unprecedented.” As a matter of fact, this was not even the strongest wind the Napa and Sonoma areas had experienced in 2017. There is also a strong temporal link between the time and source location of the wildfires and the time and location of reports of downed power lines and transformer explosions. Here, there were dozens of 911 calls reporting downed power lines and exploding transformers, in the origin area of each of these fires in the moments proceeding ignition. Why then the repeated references by PG&E to “hurricane” strength winds? State law requires power lines must be able to withstand wind speeds of at least 56 m.p.h. Thus, “hurricane” strength winds of 70+ m.p.h. 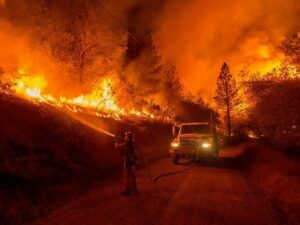 could exculpate PG&E from liability if its downed power lines caused some or all of these wildfires. However, as the weather data shows, the wind strength at the time the fires actually began was significantly less than hurricane strength. In fact, the peak winds, which occurred long after the fires started, were not even “hurricane strength,” which is defined as sustained winds for at least one minute and a minimum of 74 m.p.h. So not only were PG&E’s statements grossly misleading from a temporal standpoint, they were simply factually false. Because the investigation into the cause of these catastrophic fires has not yet concluded, there has not been any formal announcement of responsibility by PG&E, despite the significant circumstantial evidence. However, one thing is certain, these fires were not caused by “hurricane force” winds or an “unprecedented wind” event.